HERE IS THE PROPHETIC WORD IN THIS DAY AND SEASON. New clarity of your purpose is unfolding in this season, says the LORD. I Am bringing the fragmented areas of your life together that have been isolated and disconnected to perfectly fit into your purpose. You have many areas that in themselves do not make sense. They seem to be a waste of time and only created distractions and delays. But as I do this and put these pieces together, you will see that I Am taking these areas and will make sense out of the nonsense. I will take the bitter and make it sweet. I will take the things that were negative and turn them into the positive. I will take the times of loss and restore. I will take the empty and fill it. I will level the mountains, and cause the valleys of despair to become fertile ground. I will rain upon the times of drought and call forth a harvest out of the earth. Your darkness will become light, and your defeat will be turned into victory, says the LORD. The days of your mourning will be ended, says the LORD. I will set the lonely into families and bring the obscure into the light of a new day. Your isolation and feelings of purposelessness will be over. The times of refreshing will come from Me in My presence. The answers that you long for will be clarified and you will understand that what I do is perfect, on time, and everything has meaning. I will use everything about you for My glory and My grace will be abundant. Trust that you have purpose and that things will be aligned in your life to fulfill your purpose in Me. I will complete everything in you that I started and I Am perfecting everything in You that concerns you, says the LORD. 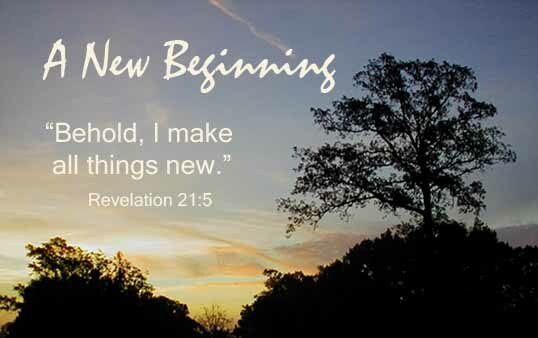 The best is yet to come and your heart will rejoice in this season as I make all things new, including you, says the LORD.